Khweza Bed & Breakfast i Nairobi, Kenya: Bestill nå! No refund for cancellation, no show or reduction in numbers within 1 week of arrival. 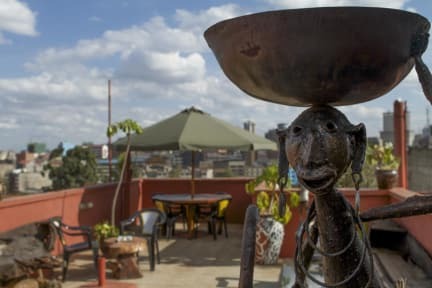 Khweza Bed and Breakfast Nairobi is a homely, African decorated, budget B&B, located 5 minutes from Nairobi city center, offering magnificent views of the city and a warm welcome by our friendly staff. We offer complimentary full breakfast, with a selection of fresh fruit, sausages, eggs, toast, fresh juice, sweet potatoes, arrow roots, tea or coffee, etc. We are able to cater for special diets. Khweza Bed and Breakfast Nairobi, also offers complimentary wireless internet and can arrange for airport transfers and tours/safaris. 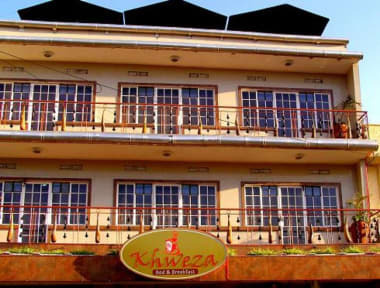 Come visit Khweza and experience the difference! Breakfast is served from: 06:30am - 9:30am at the rooftop restaurant or in your room if requested. From airport to our hotel is a 30 minute ride by taxi or car. We can arrange for a taxi to pick you up at the airports.